Without photos, memories fade. Life goes on and, we do not think about the details of that day. But when we look at pictures, the feelings, sights, and smells come back. That’s the thing about images; they’re drug-free memory boosters. Our recollections are a quantum leap beyond what computers do. But that’s changing; AI is closing that gap. But one thing they’ll probably never do is appreciate a sunset. That’s is something only we can do, assuming we don’t forget to go to the beach. 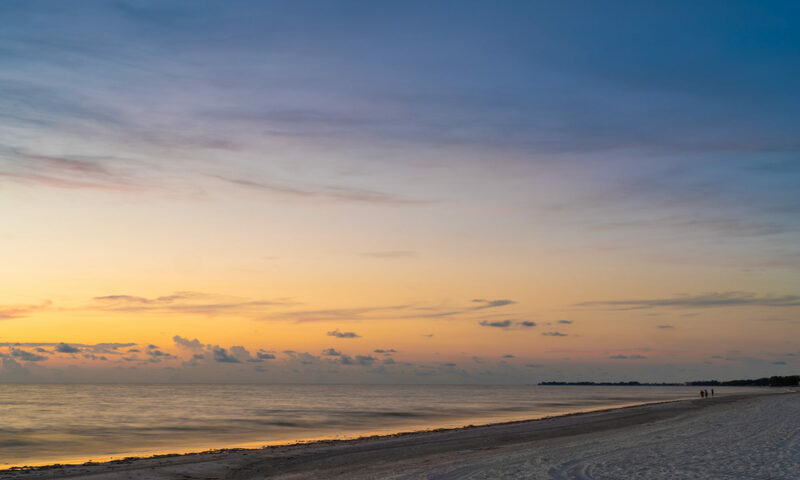 This idyllic scene is from the beach on Anna Maria Island. Florida has a lot of islands and this, to my mind, is one of the best. Regarding beaches the sand is pretty amazing, it’s a white powdery substance more like sugar than sand. But I digress, this is about the photo, not the sand. Anyway, now and then I get lucky, this is one of those days. I couldn’t take a bad picture if I tried. That makes up for all the other times when I show up and clouds obscure the sun. The success rate of a sunset photographer (such that I am) is disappointingly low. But this was a good day, so all is forgiven. A “sunset photographer” sounds like a great job, doesn’t it? Imagine getting paid to take pictures of the sunset. You show up to work about an hour before sunset, take photos for about an hour, and then you’re done. In reality, I do things other things than this, but I must say, sunsets, especially good ones, make all the other stuff worthwhile. I’ve compiled a montage of a few photos as a study of the compositional element of reflections. I use reflections in many of my images and am intrigued by their potential for metaphor and allegory, which of course varies for each viewer. The same day another sunset. I’ll be posting several photos from this day because I ended up with five or six good ones; for me, that’s a lot. Truth be told I have a low batting average when it comes to photos, but on this day, I hit a couple of home runs. I only post the photos I truly like; the others get relegated to the archives or reject bin. I’m not berating myself, it’s just that the hit to click ratio is low. I get carried away when taking sunset photos. But in my defense, it’s also how I get in the zone and it helps me become aware of scenes around me. Taking a lot of photos is a way to get creativity flowing; it’s similar to stretching at the start of the workout. One thing I like about this photo is how the sun highlights the tall grasses in the foreground. The lifeguard stand is mid-way through the image and the ocean is beyond that. Those three elements create a sense of depth that pulls our eyes into the scene. I also like it because it’s a sunset, but I take a million of those, as you know. This was taken at Coquina Beach one evening last week. I took a similar picture a few years ago that I wanted to try and repeat. Over time my preferences and technique evolve and it’s fun to retry shots to see how they come out. As in an earlier post this week I mention that the software is getting better. Both images are HDR but notice how much better the ghosting is in the newer version. In the older version, you can see double impressions of tall grasses, not so in the new one. I used Photomatix in the old version and AuroraHDR 2018 in the new image. Maybe I should go back and reprocess the old version in AuroraHDR just to see how it turns out. I know some of the rescuers that work at this beach and these stands are where they spend much of their time. There’s some kind of aesthetic of lifeguard stations on a beach that begs to be photographed. I’m not sure what it is but I have a collection of them. Of course, it doesn’t hurt if there happens to be a nice sunset as well.